QODBC crashes QB Desktop 2017 after completing all SQL transactions. Here are the details. 6. Upon the SQLDisconnect command, the QODBC connector successfully disconnects from SQL. 7. Upon the SQLDisconnect command, the QODBC connector crashes QuickBooks Desktop 2017 in an attempt to close the QuickBooks instance in the background. i.e. 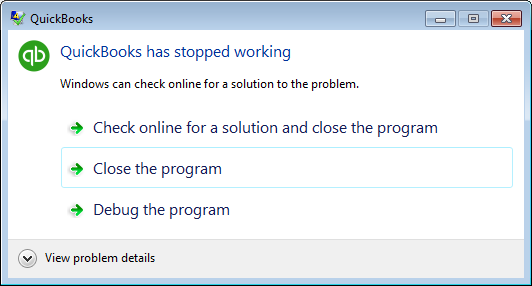 QBW32.exe sends critical error that it crashed. 8. We have to manually close the critical error box in order to send another SQL command to the QODBC connector. Very cumbersome to our process. The issue is related to Microsoft .NET Framework. QuickBooks 2017 installs Microsoft .NET Framework 4.6. If your machine is already updated to 4.7, then you may face this type of issue. To resolve this issue, You need to uninstall QuickBooks 2017 and Microsoft .NET Framework 4.7 & Reinstall QuickBooks 2017 which install .NET Framework 4.6. After that, you can upgrade from Microsoft .NET Framework 4.6 to Microsoft .NET Framework 4.7. This will fix the unexpected crash errors on the QuickBooks connector closing QuickBooks.